You asked us to provide a variety of information that would help you to be more sustainable, save money, and be healthier, so we are happy to announce return of the Sustainability Expo! You enjoyed last year’s Expo but asked for even more information and a centralized location, so we did that too. We’ll have A TON of information on recycling, food, composting, travel, and gardening, cycling–even chickens! And that’s just the tip of the iceberg; see the full list below. There will be experts on hand to answer your questions, plus LOTS of random door prizes for attendees, and if you visit a lot of tables, you have a chance to win a Provisions Gift Basket from Grey Plume! Where: Lower Storz Pavilion, located on the north side of Clarkson Tower. Head north at the Chapel, take the winding staircase by the artwork. Why: To have your questions answered, learn something new, and help you to be healthy save money, and live sustainably. Use a few minutes of your lunchtime to learn about the topics that interest you, and gain information you can take home and apply. Visit the LiveGreen table to make sure you are signed up for the listserv, get information on the latest sustainability initiatives on campus, ask questions, get information from the community, and see if you won a door prize! Have questions about recycling on campus? How about recycling at home? We can answer all your questions! You can take a fast recycling quiz to win prizes and enter the “guess the lab recyclables in a beaker” contest to win a repurposed prize from the Union Junktion! Master Gardeners will be on hand to answer your questions. Want to know if your tree has a disease? What should you plant in that shady spot on the side of your house? Why your favorite perennial doesn’t flower as much as it should? You bring questions and they will have answers. Know of all the wonderful benefits of composting, but not sure how to get started? Come talk our composting expert for advice on how to get started, and what to put in your pile or bin. No yard for a compost container? Learn about a no-mess way to compost kitchen scraps in your apartment or condo. Back by popular demand, the worms will be happy to show how they can work for you! You’ve heard of TravelSmart, right? If you have, feel free to swing on by and talk to us! We welcome your questions and feedback. If you haven’t, come learn how you can save money on your commute, drastically decrease pollution, and even get free parking! Lately lots of focus has been placed on grains and other sources of protein, to eat more sustainably and compliment a vegetarian/vegan diet. It’s easy to find recipes, but who wants to spend the money if you don’t know what it tastes like? Visit the Sodexo table to taste test a variety of recipes and if you like them we’ll provide the recipe so you can make them at home. Sodexo is also working to remove styrofoam from all of their cafes and cafeterias. They’ll provide information on this transition as well as what you can do to help reduce your waste as you dine. Have you heard of Mindfulness but aren’t really sure how it applies to you or how to get started? Mindfulness is all about focusing your attention on the present moment and accepting it without judgement. Mindfulness supports attitudes that contribute towards a satisfied life, helps you to acknowledge and enjoy the pleasures in life as they happen, be fully engaged, and helps you to deal with adverse events. Mindfulness has been scientifically shown to relieve stress, improve sleep, reduce chronic pain, help with gastrointestinal difficulties, lower blood pressure, and treat heart disease. Come visit with Susan Smith, R.N., B.S., CEAP, to learn the basics of mindfulness and how it may help you to lead a more satisfied life! Did you know the National Park Service turns 100 years old this year?!? Did you know all 4th graders get into National Parks for free? Come visit the National Park Service table for information on special activities, National Parks near Omaha (or far away), help in planning your vacation, and maybe you can “Find Your Park“! Learn how you can “make the healthy choice the easy choice” at the Live Well Omaha table. They’ll have information on B-Cycle, area bicycle trails, and the Commuter Challenge, as well as information on programs involving healthy eating and physical activity for kids. Curious about solar power? Maybe you are considering adding a panel to your home and have questions or maybe you don’t know the difference between a photovoltaic and a solar hot water heater. Either way Nebraskans for Solar will be happy to answer your questions as well as providing information on their collaborations with Habitat for Humanity. It takes A LOT of work to keep this campus clean and meet infection control standards. Come to the EVS table to learn about the products they use to keep you safe while protecting the environment. You’ve taken all that time and energy to grow you garden, harvest those fruits and veggies, or buy from your local CSA. Don’t let it go to waste! Experts from the UNL Extension well tell you how to preserve foods properly. Make sure you are canning safely, know what can be frozen instead of canned, and learn those little tips from the experts that make everything easier. Have you seen all the benefits of rain barrels? Want to make one, but not sure how? Come talk to Andy Szatko for a step by step guide to making your own rain barrel without spending a lot of money. Andy can also answer questions about storm-water management in the city and at your home. Do you love birds? Do you wish you could attract more birds to your yard? Or maybe a specific type of bird? Many of us understand the importance of birds and other wildlife in an urban setting, but what should we be doing to preserve this relationship? Want some simple ways to foster this relationship in your own yard? Visit the Urban Bird and Nature Alliance table for all the information you need! Interested in birds across the state? We’ll also provide information from Nebraska Game and Parks on bird species around the state and how you can identify them. You may not have known that UNMC had a Cycling Club, but now you do! Anybody at the Med Center is welcome to join. They pass along biking tips, and take group rides (safer!) at a pace that works for riders of any skill level. If you are a seasoned cyclist or just getting started, you’ll want to come talk to Jeff and Ian. Do you want to grow more edibles? Use less water? Spend less time mowing? Come speak with Gus Van Roenn about planting more edibles in your yard and using it for more than turf. Live in a neighborhood where gardens aren’t encouraged? That’s OK too, there are lots of ways to grow edibles in flowerbeds and other unexpected places. Growing your own fresh food is healthy, and can save you money. Not everybody can have chicken roaming their backyards, but if you’ve ever thought about it, come talk to Jared! He can tell you about all of the benefits of having chickens, and what you need to do to get started. He’ll also have information about getting your own garden going, and on working with your neighbors so you can grow more for everyone! If you are looking for information on minor home improvements that will help you to save money on your monthly bill, make sure you check out the MUD table. They’ll have that information as well as take home kits to get you started (first come first served). There are lots of ways to increase physical activity and improve your health; everything from taking a walk, participating in a Zumba class, lifting weights or learning Yoga. Come talk to Peter Pellerito about how you can do any of these at UNMC’s Center for Healthy Living. He will also have information on the renovation and expansion, and how it will impact you. Bus Rapid Transit is not just another bus. It’s an innovative, high-capacity, low cost public transit solution that replicates a rail line. 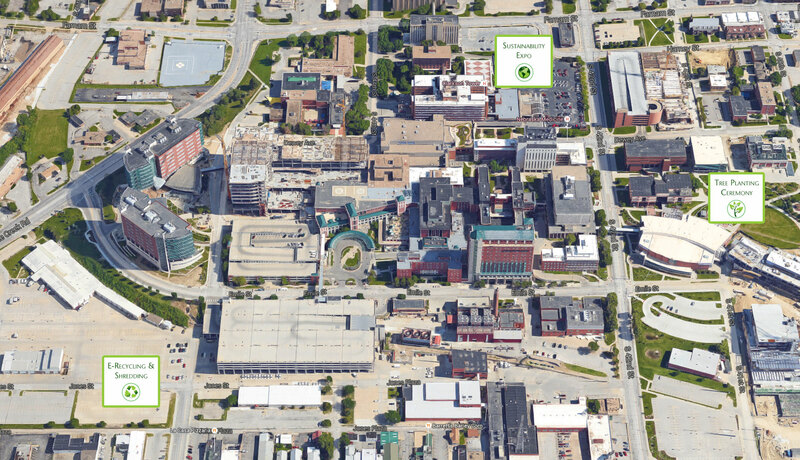 Thanks to a $15million TIGER grant, it’s coming to Omaha and the Med Center will have a stop! Come talk to the folks at Metro to see station design concepts, learn where they are in the process, and how this could speed up your commute and improve access to downtown multiple areas of Omaha! Paradigm Gardens practices sustainable and organic gardening. Experts from Paradigm Gardens will be here to talk about water-wise gardening, hydroponics, aquaponics, using earthworm castings, and seed-saving. They will also have information about bees and chickens being helpful in the garden. Did you know eating local honey can help with seasonal allergies? Did you know that bees are the key to agricultural success for many crops, but their numbers have been on the decline? Come learn about the importance of bees, how you can help preserve their populations, and the benefits of honey by visiting the Omaha Bee Club table! Telemedicine is the use of telecommunication and information technologies in order to provide clinical health care at a distance. It helps eliminate distance barriers and can improve access to medical services that would often not be consistently available in distant rural communities. It also saves time, money, and emissions that would have been spent on travel. Stop by the booth and talk to Kyle Hall, Telehealth Program Coordinator & Sarah Emanuel, Health Promotion Manager and they’ll show you a variety of telehealth tools. You will also receive information about a few Apps to help you on your journey to good health. Come meet Fork N Farm! Fork N Farm is an urban farm nestled in the Benson Neighborhood of Omaha, practicing natural and sustainable farming techniques to create healthier local food. They use the best seeds and practice seed saving, do not use unnatural or toxic chemicals; instead spending time to plan our fields. Using nature to our advantage through soil management, low till, companion planting and crop rotation. Protecting the environment is just as important to us as growing clean healthy food for our community. Local food is important for our community economically and nourishes positive social interaction between people. Did you know the Habitat for Humanity Restore is a great place to get supplies for your next home improvement project or Pinterest inspiration? They sell items in smaller quantities and at lower prices, while keeping them from the landfill and helping to provide housing for those that need it! What’s better than that? And they’ll come pick items up from you for free so you can continue the circle of giving! Come talk to David Klitz for information about how the Restore can work for you. The Metropolitan Area Planning Agency is a regional Council of Governments serving Eastern Nebraska and Western Iowa. Their planning efforts can work directly with you to help with transportation, air quality, disaster mitigation, economic development and community assistance. Visit the MAPA table to connect with them and learn how they can help you! The Green Omaha Coalition works to promote a greener Omaha through collaboration, education and advocacy. See what projects their passionate volunteers are working on, learn about events in your community, and sign up for their free email announcments! The Papio NRD maintains walking/biking trails, helps with water quality and flood prevention and control, and assists with recreation and wildlife. Come find out what they have been working on and when the South Omaha Trail connection will be complete! Mode Shift Omaha advocates for transportation options that enhance quality of life and opportunities to live, work, and play. Come learn about their projects, advocacy, and how these changes can positively affect you! Come talk to the folks from Tomato Tomato and learn about how they run their CSA and indoor farmer’s market. The campus CSA is run through them and you can sign up while you are there! Get fresh, local veggies delivered direct to campus for your pickup. You get to try new types of produce, new recipes, eat healthier, and support local farmers! Wondering how we’ve made some of the incredible strides in energy reduction in the past 5 years? Want to know how a chiller works? Need an explanation on energy curtailment? Stop by the Facilities, Management, and Planning table to ask your questions and learn about future goals! LiveGreen will also collect gently use eyeglasses at this Earth Week event. We will take them to UNMC Ophthalmology where they will be given to patients at free monthly clinics.